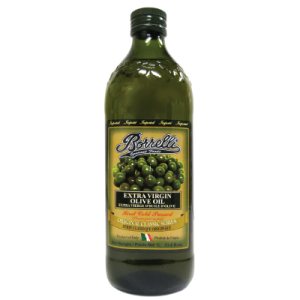 Borrelli Extra Virgin Olive Oil is made with methods that, despite modern technology, have maintained much of a craftsman-like process that guarantees the integrity of this fine oil. It is an oil of 100% Italian origin. It is a product of the first cold pressing of carefully hand picked olives, and its acidity is less than 1%. It is a genuine aromatic oil that is delicious, beneficial, and full-bodied. It is the heart of the Mediterranean diet.